Martha Berry informs Miss Lamont that the Berry Schools are in trouble beginning the New Year without the proper funds and asks for her immediate help. 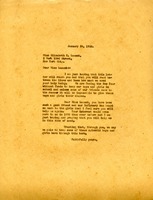 Martha Berry expresses her desire to see Mrs. Frank Inman, which was impeded by her hectic schedule. She also proposed Mrs. Frank Inman meeting with Mr. Cooper and Mr. Carlson.